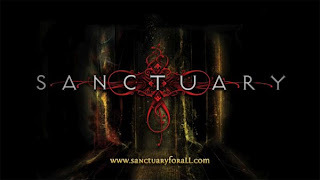 Now that the second season of Sanctuary aired last Friday, allow me to ramble a bit about my thoughts and questions for the season. The season premier "End of Nights, Part 1" takes place a few months after the events of last season's finale, "Revelations, Part 2," which ended with quite the cliffhanger. I rather enjoyed the episode, which involved quite a bit of action, many different settings, the introduction of a new character, and more. Viewers new to the series may find themselves lost and wondering who all these people are, why they can do so many weird things, and did they seriously call that guy Jack the Ripper? so I would recommend watching some of the last season (Hulu's still got the last four episodes up) and/ or reading up on the characters before diving into this season. The Funny Evil Doctor Lady: Why does she have a limp? The way one scene is done seems to emphasize it, so was it caused by some significant event in her past? What happened to her daughter? "She didn't survive" really isn't a normal way to talk about a loved one's death and implies a violent death to me. The Project: Is the Montana Project subject who got away (the one Druitt got to) going to have a significant role, or was accelerating the operation her only significance? Ashley: How will the acceleration of Phase 2 effect its results? Will Ashley's brainwashing and new abilities be effected by the rush-job? Will Ashley be able to return to the Sanctuary when this is all over? Will and the Invisible Girl: Was Tesla's comment foreshadowing? Is Will doomed to forever be called "huggy-bear"? Why have there been no Susan Storm jokes? Lazarus: Has the out-break been effectively quelled, or will it continue to cause problems? What are the Big Cabal Lady's personal motivations? What are her real reasons for doing anything? The season starts with an intense, three episode arc, the last episode of which is called "Eulogy." Is this a symbolic eulogy, or does a character die, and if it's the latter, who is it? I have a few theories who it might be, but I hope I'm wrong, so I won't say anything. 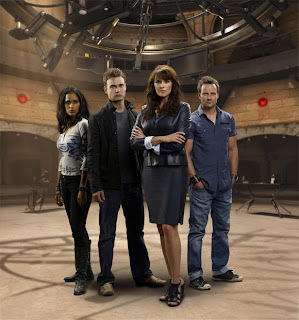 Syfy's promo cast photo for the season (on the right) does not have a certain prominent character. Whether this is intentionally miss-leading or a clue about the story arc, only time (or spoilers) will tell. Will Zimmerman (played by Robin Dunne) has a Bollywood Dance scene near the end of the season. And this apparently makes sense in context (at least, according to the Press Day). I really want to know about that! There is a new character: Kate Freelander (played by Agam Darshi). So far she seems to be an interesting character. What we've seen of her so far really reminds me of Faith in Buffy the Vampire Slayer, sense of humor-wise. I'm interested in whether or not this mercenary character has any past issues with abnormals, and in how her character will grow and develop over the season. And, to end this rant, a link to video of Sanctuary's Press Day, from Wormhole Riders: Part Two has a clip of Robin Dunne's Bollywood Dance! After seeing the 2nd show, I'm wondering what happened to Ashley - did she move on from The Sanctuary and so this is how she "leaves" the show, or will she be back somehow? Anyone have thoughts? It's been hinted at in some interviews that this is not the last we'll see of Ashley. Also, the creator made a comment about comic-style return if there's a season three.